Volunteer Co-Directors provide native English speaking guided conversation classes each week. Several levels of comprehension, experience and topics are provided during the two-hour sessions held Tuesday through Saturday. Conversation classes may be guided by a book, newspaper or magazine articles, current events, peace and other cultural and daily living topics. Classes emphasize individual participation in a relaxed setting and often include tea and snack refreshments. The class fee is 2,000 Yen per session or 6,000 Yen per month. For students, the class fee is 500 Yen per session. Many students have frequented the center and attended classes for 5, 10 or even more years. Classes also participate in group activities ranging from eating out at a local restaurant, cooking, or touring a local business or scenic sight, to the preparation of Peace Lanterns or Peace Candles to honor traditions of Hiroshima. Center of Wilmington College, the World Friendship Center, and other Peace Centers. The Co-Directors as well as WFC Volunteers visit Mutsumien Nursing Home monthly. Activities may include singing, talking, storytelling, planned entertainment and celebrating birthdays. During select years, citizens of Japan visit the United States or Korea and on alternate years, guests from America or Korea visit Japan, all part of the ongoing Peace Ambassador Exchange (PAX) program. The focus of the PAX program is to network and exchange ideas and materials related to peace, reconciliation, and nuclear issues, and to hear first-hand accounts of those whose lives have been impacted by war and the tragedies of atomic bombings. To foster interest in the PAX program from America to Japan exchange, the American Committee makes available up to four PAX Travel Scholarships. See Application Details, including a simplified submittal and applicant selection process. Peace Ambassador Exchanges are the evolution of Barbara Reynolds' belief that world peace begins with the building of personal and lasting friendships - in her words, "To foster peace, one friend at a time." You can read more about PAX in WFC's Yu-Ai Newsletter #155. The WFC strives to provide unique and valuable experiences which connect local Japanese residents with international visitors from around the globe. Peace Seminars are conducted in Japanese to study peace and anti-nuclear issues and to develop projects. Topics are chosen by the members and deal with international peace issues. We meet to watch a movie, hear an interesting presentation and participate in a discussion – in English. Anyone who is interested is welcome to join us for Fun Time in English. The Peace Choir has been gathering to practice and perform songs in both English and Japanese since 1997. Under the direction of Asaka Watanabe, a professional musician, the choir performs both as a small group and also as part of a larger performance, such as the August 6th Memorial in the Peace Park across the river from the A-Bomb dome. Peace Camp is held each summer to bring together young people from Japan, Korea, and China. It’s a chance for them to share thoughts and ideas, learning to respect each other’s cultures. 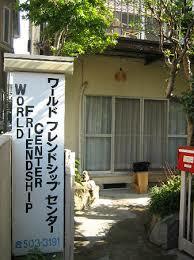 The World Friendship Center is a small institution and has limited opportunities for interns and volunteers. However, we welcome both if the timing and scope of the intern or volunteer fits into the WFC schedule. For more information send a letter of inquiry to: worldfriendshipcenter@gmail.com. WFC will respond with application materials. Applications will be reviewed by the chair and co-directors of WFC as received.